Ireland and Arsenal defender Louise Quinn heads home a late winner against Everton in the semi Final of the women’s FA Cup in the Marine Travel Arena, Liverpool. Arsenal and Chelsea will contest the 2018 Women’s FA Cup final at Wembley on Saturday, May 5. Most emotional goal reaction you’ll see this season…. 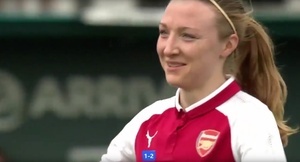 Posted in Misc and tagged Arsenal, Louise Quinn at 1:43 pm on April 16, 2018 by Aaron McAllorum.